A brief History of H M Schooner Pickle (Dec 1800 to 27 July 1808) – a ‘clever, fast schooner, coppered’. An exceptional marine painting measuring 63 x 91 cm (28″ x 36″), oils on canvas, available price upon application. This famous painting is available as are a few remaining limited edition prints. Of the prints, they are literally fit for a Princess: Print copy No 1 framed with a menu, was presented to The Princess Royal, Princess Anne at HMS Seahawk mess, RNAS Culdrose, a dinner given in her honour in appreciation of her able assistance during the 200 th anniversary of Trafalgar and the recreation of HMS Pickle’s historic voyage with the Trafalgar dispatches. Looking for the best? You have found it here. Now more people will enjoy “I Have Urgent Dispatches” thus adding to the print’s value as a pleasure to own and an investment. Even if your German is as mine, rudimentary, I still recommend you have a look at this book if only because it has such an International feel and such care has been taken over the illustrations. You can discover more about the extraordinary HMS Pickle by checking out “I Have Urgent Dispatches” via the link below. Acquire, simply, securely; to place a deposit or payment on our Payment page to make this or a similar painting, yours. “I have urgent dispatches”, The Royal Navy’s most famous schooner of war H.M. Schooner “Pickle”, a sometimes controversial account of the vessel, the painting, the news of the momentous Battle of Trafalgar. His Majesties Schooner Pickle is shown on the 1,000 mile voyage for home, battling the great gales which followed the action off Cape Trafalgar. “Pickle” sighted another ship which gave chase; she turned out to be the 18 gun sloop “HMS Nautilus”, Commander John Sykes. Eventually in particular in consultation with Peter Goodwin and Dr. Colin White it was decided that none of the existing representations of ‘Pickle‘ were accurate. They agreed with a few modifications the model in the Royal Naval Museum, Portsmouth would form the basis of this picture. The model is some times wrongly called HMS Pickle. The model in the Royal Naval Museum while a fine model was known to be never intended to be ‘Pickle‘. According to Dr. Colin White, Curator, the model is more likely based on the plans of a similar schooner, HMS Hadock. Colin White shared the opinion that Pickle was not built at Bermuda, more likely at or near Plymouth, Devon as a fast cutter for smugglers. From Gordon Frickers Pickle notes, here are some of the gems in a lengthy summary, enjoy; and if you too have a Pickle yarn do write to Gordon. To describe The Trafalgar Messenger”, HMS Pickle, Gordon has written a separate piece that accompanies that painting. Both pictures are available as Heritage Prints, signed and numbered fromwww.frickers.co.uk price including packing, insurance and post £147.00 at 12.01.2015. 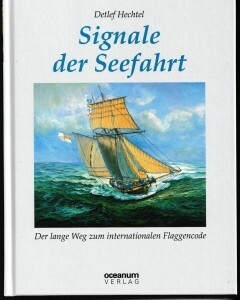 In the notoriously stormy autumnal Bay of Biscay the schooner “Pickle” commenced signalling her dramatic news by flying the 1805 code signal flags 2214 at that time a new code devised by Admiral Popham and capable of conveying over 3000 words and phrases, 2214 meaning “I have urgent dispatches”. Pickle was employed in many roles summer and winter, tender, patrols, dispatches, as the eyes of the fleet and the most dangerous, inshore blockading. One wag aboard HMS Britannia described her as “about as dangerous as a pair of boots”. It would have required fine seamanship, sound navigation and good leadership to keep her from harm. Her captain, Lieutenant John Richard Lapenotiere who had himself been an ordinary seaman had that experience, much of it gained years earlier off the coast of Alaska. Incidentally in Nelson’s fleet, all three ‘seaman’ officers (men promoted from the ranks) at the battle of Trafalgar were Devon men. Many of Pickle’s crew were Devonians and Cornishmen. The Royal Navy was an organisation were men could and did rise on merit, James Cook being an outstanding example..
Life was cramped, intimate and hard on a naval schooner. Many sailors spoke of being constantly wet, leave was rare. The punishment book from Pickle (in the PRO, Kew) has more than the average number of entries. Unsurprisingly on two separate occasions crew members were court-martialled for mutinous conduct (SNEEDON on 03/10/03; and BOSWELL July 1804 – 26/07 ‘a seaman’ was flogged round the fleet at Plymouth). At Trafalgar Pickle’s crew was typically for a British war ship, comprised of many nationalities including a Frenchman and 3 Americans. A similar schooner played the part of HMS Pickle during the 2005 commemorations. The modern Pickle is not an exact replica however she and her people deserve our respect, the experiences of her crew particularly in heavy weather are quite enlightening. One kindly wrote to Gordon and among other things praised very highly of the vessels performance. An unfathomable mystery. The records are in a bit of a pickle. During his research Gordon Frickers encountered many conflicting opinions. Gordon Frickers original research gives us a different perspective of HM Schooner. The following is based upon a careful survey of the available evidence in England, France, Bermuda, the USA and Spain. Origin of the Pickle, in the beginning, this schooner was documented as formerly the cutter ‘Sting’. The documents are in the public records office at Kew in London. Most sources say that she was originally a cutter, others a schooner. The respected authority Richard Woodman when questioned by Gordon’s correspondent Eric Cowell said that she was originally a schooner. Where was Pickle built? In recent years several otherwise knowledgeable scholars have stated HMS Pickle was built at Bermuda and this seems to be becoming accepted. The ‘Sting‘ PRO documents alone destroy the myth that Pickle was built at Bermuda, but read on, there is more. An HMS Pickle was built at Bermuda; in 1820. The battle of Trafalgar was fought on 21.10.1805. May I leave you to do the maths? Our HMS Pickle was in her time considered a very small, very seaworthy, rather quick craft. Pickle’s specific dimensions were noted at Devonport, Plymouth as 73 ft (22.25 m) on the gun deck, 20 ft (6.096 m) beam, 9.5 ft (2.896 m) depth in hold for a tonnage of 127. At Devonport no mention of where she was built was recorded. That usually happened with vessels built at Plymouth, built else where and the place was usually mentioned particularly if built ‘foreign’. The original Pickle had no figurehead. Confusion: Admiral Lord Hugh Seymour, C in C Jamaica, in defiance of Admiralty instructions, purchased her “at Curacoa” one source states, as the Sting in December 1800. Sting to be a replacement for the “Pickle”, tender (P 263 Sailing Navy List) to “Sans Pariel” for service as a patrol and dispatch vessel, when he secured the island against French invasion at the request of the Dutch governor, to be under British protection. The Seymour correspondence ADM 1/250 lists all vessels found at Curacao when Seymour arrived on the 23 Oct 1800. Sting was not listed however Seymour clearly knew of her and wanted her. 21/12/00 ( ADM 1/251 31/01/01). One record says she was ‘found’ in Curacao when the British with American aid captured the island on the 22 of September 1800 from the Dutch and French. Consequently some authorities have suggested Sting was one of 7 American merchant ships in Curacao. Adding to the confusion The London Gazette Jan 23 1802 stated “Rear Admiral Montague to Evan Nanpean from Port Royal, 19th Nov 1801 “Armed tender Pickle captured a large Spanish schooner. This vessel was the original HMS Pickle (5 Royal Navy ships have born the name ‘Pickle’, the most recent was a minesweeper in World War Two) which was certainly a Devonport ship attached as a tender to HMS Sans Parriel. Sting was registered by Admiralty Order of 19/02/01 as tender to the Sans Pareil, (an ex French prize – name in English, “Without Equal”) Seymour’s flagship. As today, as then were plenty of agents more than willing to help a person, particularly an Admiral find the right ship and Seymour was specific in wanting no ordinary vessel, rather a clever fast schooner and coppered (expensive). Origin; The Royal Navy eventually purchased this vessel for £2,500. 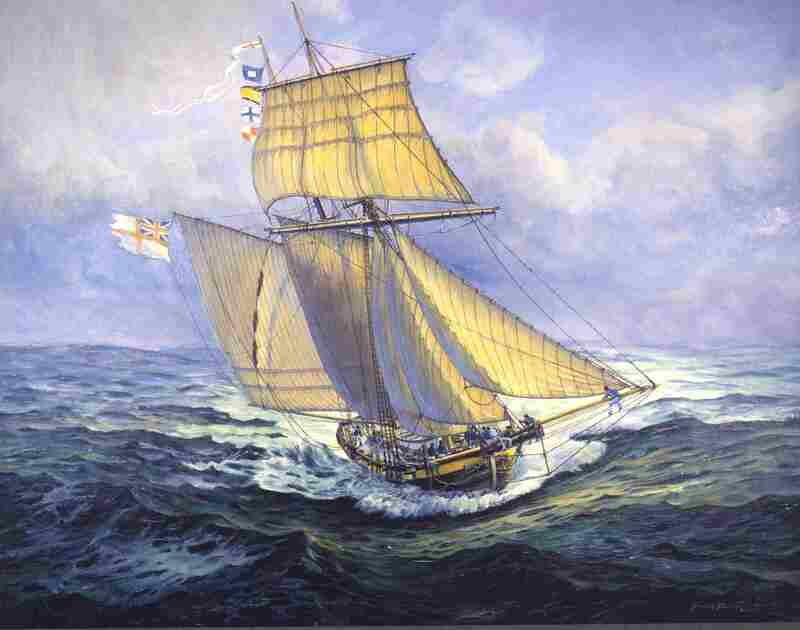 Pickle is described as a ‘clever, fast schooner, coppered’ but when officially accepted into the Royal Navy no decisive information as to her origin is apparent. She is listed simply when purchased as the armed cutter Sting. Considerable controversy and confusion surrounds were she was built. It is sometimes stated Pickle was built at Bermuda. Gordon was unable to find any documentary evidence to support that claim. A third Pickle was built at Bermuda in 1820. The Bermuda claim seems to be caused by careless reading. The interesting web site http://www.bermuda-online.org/rnd.htm states a Bermuda-built cedar schooner HMS Pickle was ‘Nelson’s Pickle’. One is inclined to think the Bermuda claim is more about prestige than historical fact. October 1796 to July 1807, list of ships seized for illegal trading; April 1787 to January 1790 volume 1, February 1787 to August 1809 volume 2. Guess what? No “Sting” or “Pickle” is mentioned. If Sting/Pickle was built in Bermuda, surely she would show up in these sources? Thus far no record has been presented to support either a Pickle or a Sting cutter built at Bermuda or anywhere else during the time period we are considering so for those and other reasons it is likely she was Plymouth built. Certainly the armed cutter Sting was destined to become a Plymouth Devonport vessel. We can be sure Nelson’s Pickle was the second Royal Navy ship to carry the name of Pickle (there have been a total of 5) and based in Plymouth. We also know at that period West Country ship wrights were building clever, fast cutters, coppered for ‘The Trade’; meaning smuggling. Coppering was only applied to vessels considered important. Pickle was coppered, expensive, a further indication she was intended to be fast. In the days before modern anti foul paints coppering, a late 18 th century English innovation, had been found to provide extra protection from marine growth and marine borers thus improved speed and extended the hull life. Coppering was then a new, expensive technique so not usually applied to small craft without a very good reason; a reason like smuggling. Further more the schooner rig had not caught on in Britain at that time, English smugglers generally preferred brigs, luggers and cutters. Interestingly the name Pickle appears in other forms in the Plymouth area, notably Picklecombe on Plymouth Sound. The site of Picklecombe, a cove in the lee of Mount Edgecombe on Plymouth Sound, at the close of the 18 century, with plentiful timber growing nearby would have been ideal for building cutters and other small craft on the beach. By 1800 smuggling was becoming less lucrative due to the increased naval patrols. Sting acquired? : It is entirely possible that when Admiral Lord Hugh Seymour passed through Plymouth on his way to his new appointment in the Caribbean he would have had an eye open for a clever, fast cutter, coppered’. We know British Admirals including Nelson constantly complained of not enough ‘clever’ small craft. It is likely Admiral Lord Seymour would have noticed a trim cutter for sale. We also know at that period the British built/used few schooners. For various reasons the Brits preferring the cutter rig. Thus the smart cutter Sting destined to be the schooner Pickle was we think on the balance of probabilities as John Smith when senior Naval Librarian at Plymouth suggested, probably built at Plymouth, Devon a few years pre 1800. Another origin occasionally suggested and based in part on her name ‘Sting’, a style of name then favoured by Americans, has been the West coast of the US of America. Diligent research has so far failed to produce any firm evidence of Sting’s origin being the USA so it remains only a possibility. Wendy W. Schnur wrote from MSM, “All the information we have here indicates that HMS Pickle (ex Sting) was built in Plymouth, England”. British Naval records clearly state Pickle was built and purchased by the Royal Navy as Sting, cutter renamed 1802, Pickle. Wrecked 1808. Admiral Lord Hugh Seymour while C in C Jamaica purchased the vessel we are interested in as the Sting in December 1800. HMT Pickle an ‘armed tender’ based at Devonport Plymouth had been active in the Caribbean. HMT Pickle was listed as the ‘tender’ to the Sans Pareil, a ship of the line, Seymour’s flagship. A tender at that period was the ‘goffer’ for a bigger ship expected to undertake any menial task while also being available as ‘eyes’, scouting, patrolling and if needs be fighting enemy raiders, mostly privateers. Seymour described HM Tender Pickle to the Navy Board as worn out hence the need to purchase Sting. This may have been a subterfuge. The Navy Board noted the purchase with severe disapproval, close to a reprimand. The tone of the Admiralty’s order in 1802 to confirm Sting as Pickle to the Navy Board suggests an irritated response to earlier confusion over names. Sting was registered by Admiralty Order of 19/02/01 as tender to the Sans Pareil which happened to be Seymour’s flagship. The Pickle continued in service and on their books for several years after the purchase of Sting. It is likely the new tender was by habit referred to by the officers as ‘Pickle’. By Admiralty Order of 04/01/02 Sting was ‘renamed’ Pickle. The older vessel, the ‘armed tender’ Pickle appears occasionally in the Navy List as late as in 1804, but her fate is unknown. This was the period of the Peace of Amiens so the time at Pickle was surveyed and to some extent refitted to Navy standards at Plymouth. October 1801 Sting sailed to Portsmouth under the command of Lieutenant Thomas Thrush with the body of Seymour. HMS Pickle cruised, patrolled the Channel in early 1802. In April Lt Thrush was promoted to Commander. 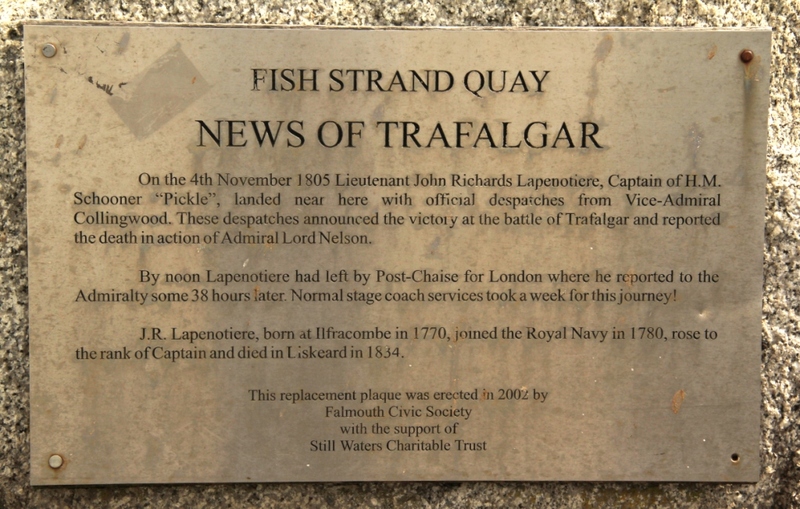 May/June 1802 saw Lieutenant John Richard Lapenotiere (died 1834 near Liskeard in Cornwall), the man with possibly the most misspelled name in the Navy, commonly misspelt Lieutenant Pelletier, appointed to command Pickle. At that time both a ‘Sting’ and a ‘Pickle’ are named operating from Portsmouth – perhaps a confusion of a recently renamed vessel? Paperwork was no better then than now, it is improbable but possible there were 2 Royal Navy ‘Pickle’s & 2 ‘Sting’s at that time; also that Sting was being referred to as Pickle, from habit, before Sting formally adopted the name Pickle. Sailing from Plymouth, Lieutenant John Richard Lapenotiere’s command was first used as a dispatch vessel. 12 October 1802, she sailed on a voyage to the Mediterranean with dispatches for Vice-Admiral Sir Richard Bickerton, Commander-in-Chief in the Straits, then on to Malta returning on the 16 February following. ‘Pickle’ had touched at Gibraltar for wood and water, making the voyage from Gibraltar in the fast time of 14 days. At Plymouth after attending Admiral Dacres, Lieut. ‘Pelletier’ took a post-chaise and four and set off for the Admiralty while ‘Pickle’ was put into quarantine in Coney Cove, Stonehouse Pool, Plymouth. She had left Malta six weeks previously. By Admiralty Order of 20/04/1803 her armament & complement were changed. After, she was usually based at Devonport, Plymouth until the end of her career and employed with the Channel Fleet on patrols and in the dangerous inshore blockade of Brest, France, through 1803 and 1804. 1803 Pickle, Lieut. 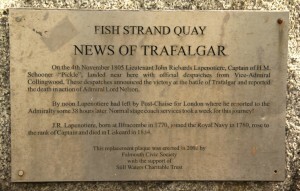 John LAPENOTIERE sailed from Plymouth on the 15 October 1803 to cruise in the Channel. On the 22 nd of October Pickle took the American vessel ‘Resolution’. Pickle sailed from Plymouth again on 28 December and returned on 31 January 1804 having lost her main-topmast and foreyard in a gale on the 19thJanuary. 22 February 1804 she sailed for Admiral Cornwallis with dispatches. 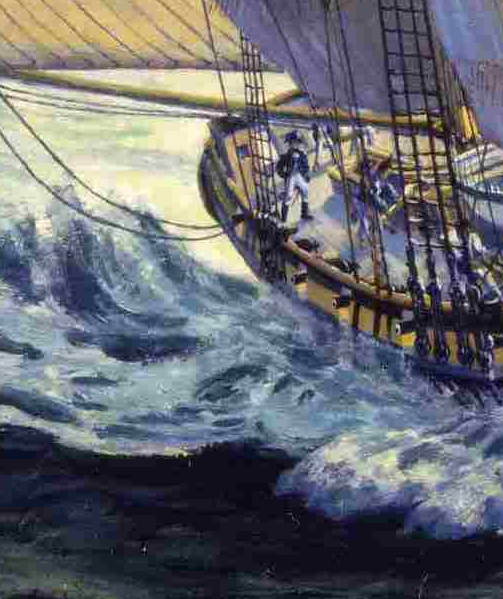 On 25/26 March 1804 ‘Pickle’ while on inshore blockade duty was present at the loss of HMS ‘Magnificent’ 74 guns, a ship of the line of battle, wrecked in a violent tempest on an uncharted rock when the wind and tide changed direction near the Pierres Noires, off Brest. ‘Magnificent’ commanded by Captain W H Jervis, nephew and heir of John Jervis Earl St Vincent had been lying at anchor near the Black Rocks off Brest. In attempting to get under way between 8 and 9 in the morning of the 25 March ‘Magnificent’ struck an unknown shoal of rocks. Within an hour the water was up to her orlop deck. Despite strenuous exertions by all aboard the ship could not be saved so nothing remained to be done except try to rescue the crew. Boats at great risk in the squalls and swell from ‘Pickle’ and the ‘Fox’ cutter unhesitatingly went alongside soon after ‘Magnificent’ struck and assisted in the successful rescue of survivors. The frigates ‘Indefatigable’ and ‘L’Aigle’ anchored on the bows of the ‘Magnificent’ while the ‘Pickle’ and ‘Fox’ worked off her starboard quarter. They had taken out her people by 10.30 am just before the ‘Magnificent’ rolled over and sank. HMS Colossus took the survivors back to Plymouth. On 26 July 1804, a signal having been made aboard the flag-ship in the Hamoaze, a seaman from Pickle attended by the boats of the fleet manned and armed, was flogged around the fleet in the Hamoaze and Plymouth Sound for mutiny. A seaman from ‘Doris’ was flogged at the same time for maiming a shipmate with intent to kill him. Pickle left Plymouth for Ferrol in September. In October the same year Pickle captured two French coasters off Brest. Pickle brought them into Plymouth. They were loaded with supplies for the fleet at Brest. On the 1 October 1804, Pickle came in to Plymouth with 2 Chasse Maree, French coasting vessels usually employed hunting fish. Pickle had driven them into a bay then using her boats boarded and brought them out. They were laden with wine, brandy, and wheat destined for the French fleet at Brest. On 3rd January 1805 Pickle made the passage from Ferrol to Plymouth with important dispatches from Rear-Ad. Cochrane in just 49 hours, this was considered a very fast passage. The 98-gun Neptune arrived the same day after taking ten days over the same passage, but she had been delayed by earlier gales. In early 1805 Pickle made a voyage to Jamaica. There a new Master, the American born George Almy came on board, said to originate from Newport Rhode Island. Pickle returned to Plymouth in May. After voyages to Lisbon and Gibraltar, Pickle on 1 October 1805, having taken an American brig ‘Indefatigable’ en route joined Nelson’s fleet off Trafalgar. Prize money in that capture was authorised for payment in April 1807. Pickle’s actions for the next three weeks are well known. She was much mentioned by Nelson during that month. Nelson described her as “ubiquitous”. On October 9th 1805, the Pickle with HMS Weazle was sent to assist Captain Henry Blackwood commanding Nelson’s frigates monitoring the enemy coastline off Cadiz to provide information for the British fleet. During this period prior to the Battle of Trafalgar, the Pickle was able to capture a Portuguese settee, a single decked vessel used as a transport which was carrying a much needed cargo of bullocks from Tangier to the French and Spanish ships at Cadiz. This cargo was used to replenish the British fleet. Nelson’s men ate well. The meat was fed to the British sailors. Pickle was observing and reporting to Nelson all through the run up to the Battle of Trafalgar. Pickle even managed to sail close enough to the Cadiz coast to count the exact number of enemy ships of the line of battle – 33 in Cadiz harbour and report. On the historic Monday of the 21st of October 1805 Pickle was attached to the Weather Division of the fleet under Vice- Admiral of the White Lord Nelson. By convention, as one of the 2 smallest ships present, she was not expected to engage. One broadside from a ship of the line would literally blow to fragments a vessel the size of Pickle so she became spectator of the Battle of Trafalgar. Despite that Pickle still managed to distinguish herself during the battle. Her boats being among those engaged in the highly dangerous work of rescuing French survivors from the blazing 74 Achille, more about that in a moment. 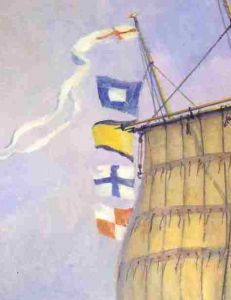 She appears and is easily recognised in the left corner of Gordon Frickers painting “Trafalgar Dawn” and again in the companion piece “Trafalgar Dawn the French Perspective”. Both those pictures are available as signed numbered prints. They make a very unusual pair. To date (08.03.2016) only 4 people have the pair. The original painting “Trafalgar Dawn the French Perspective” is currently available from the artist for £8,000. With the Cutter Entreprenente commanded by Lt Robert B Young (the smallest ship present at the battle of Trafalgar 7 ×2½ 123 tons, a French prize taken in 1800 which kept her original name – described as a dispatch boat, broken up June 1812) and the boats of Swiftsure, Pickle helped with the dangerous rescue of about 200 men and a little surprisingly, 2 women from the French 74 Achille which suffered the great misfortune of catching fire during and exploded at the end of the battle of Trafalgar. Two or three seamen in the other boats were reported killed by the French guns going off as they became heated. One of the women, the French woman ‘Jeanette’, has left us a dramatic account of her departure from the burning Achille. Edouard Desbriere wrote an excellent account of “The Naval Campaign of 1805, Trafalgar” (long out of print and now rare, valuable) from the primary French and Spanish official records. Gordon’s copy includes a series of maps and drawings made by senior French and Spanish survivors. “looking a picture of misery & despair”. Desbriere gives us an interesting insight into the true characters of many of the Royal Navy officers and men when he recounts the story of Jeanette. She was the wife of a maintop man. She was stationed in the passage to the forward magazine, employed passing up cartridges. She stated all the main deck ladders were shot away. Blazing wood fell down the hatches. Startled by heavy crashes she saw the main deck planking above her burning and some guns fell through. Terrified she ran aft to the gun ports and climbed through one of the ports then via the chains to the rudder where she scrambled onto the curved after edge. Melting lead from the trunk lining dripped onto her neck & shoulders. Stripping off she jumped and swam to a piece of wreckage. The French man on it kicked her away. She found a smaller piece. Later another man put a large plank under her arms. Naked, eventually she was rescued by a boat from HMS Pickle, whose crew were soon out-numbered 4 to 1 by French survivors they had rescued. They gave her a headscarf, jacket and a pair of seaman’s trousers, also treated her burns. She recounted the number of men she had to fight off when they tried to take her oar. Her adventure was to become more incredible. She was transferred to HMS Revenge ‘looking a picture of misery & despair’. An officer noticed the dejected youth so made inquiries. He realized he was a she, a woman and from then her luck changed for the better. Jeanette was given an officer’s cabin and material to make clothes including some from a Spanish prize. 4 days later her husband was found on board, unhurt and the couple were re united. Pickle took on board some 160 French seamen after the destruction of the Achille, including the naked Frenchwoman ‘Jeanette’. An attempt by the French to take over the vessel was quashed. The prisoners in Pickle, three times the number of the crew, were heard plotting to take over the ship and carry her into Cadiz so a particularly sharp watch was kept over them. Most of the prisoners were subsequently transferred; two remained with Pickle until her return to England. Who they were and why has to be a good yarn but is not apparent. Five days after the battle and the following great storm the British Admiral Collingwood C in C following the death of Nelson found time to send Pickle home with the news. Pickle left the fleet on 26 October with Collingwood’s now famous Trafalgar dispatches. It was an unusual honour for so junior an officer to be selected for this prestigious duty; The appointment almost guaranteed fame, promotion and a financial reward. There is a family story which accounts for the favour. According to the family oral history Collingwood owed Lapenotière a favour for his part in the rescue of the crew of HMS Magnificent who’s commander was related to Collingwood who in turn remembered and kept his word. However Collingwood’s order diplomatically makes clear that he selected the fastest vessel available. 1805 communications compared with today. Pickle sailed for England, deep into the Atlantic. There were still many French ships at sea. During a storm her logs records her springing a leak, serious enough to force the jettisoning of 6 of her guns (no casual decision if only for the attendant paperwork). She also sighted another ship which gave chase and fortunately turned out to be HMS Nautilus, Commander John Sykes. Normally a Lieutenant like Lapenotiere commanding a schooner would repair on board the senior ship. Lieutenant Lapenotiere had strict instructions to suffer no undue delays so the 2 ships “spoke” by the newly adopted code devised by Admiral Popham. 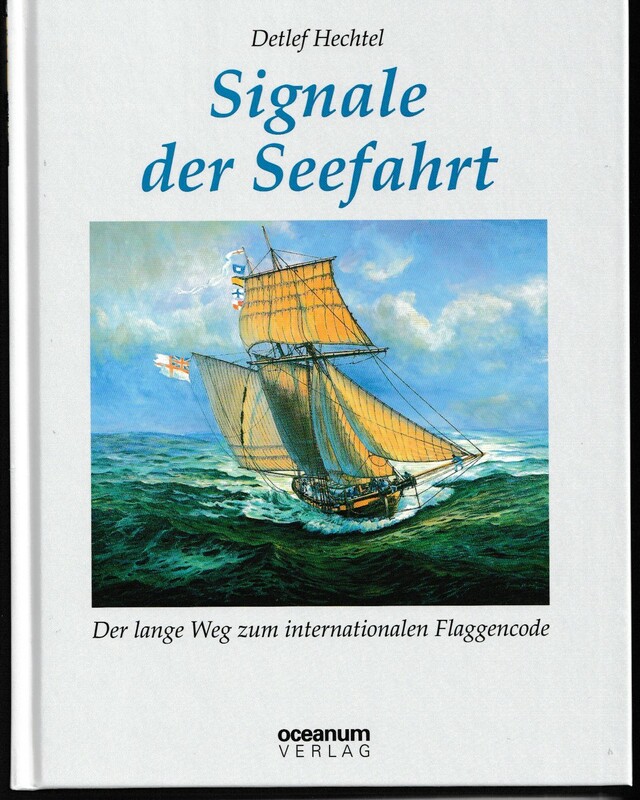 Flags 2144 = “I have urgent dispatches”, sharply contrasting communication in 1805 with today. The Commander of Nautilus appreciating the importance of the news immediately changed course for Lisbon, after which Nautilus raced Pickle sailing for Plymouth, arriving one day after Pickle. Dawn on the 4 th of November 1805 HMS Pickle made landfall off The Lizard, Southern most point of Cornwall and England. Pickle in light airs crossed Mounts Bay where, local legend insists her people spoke to some Cornish fishing luggers. The crews would have known Pickle from her patrol days, some may have been relatives; and they would have known Pickle was with Nelson. The latter immediately returned to their home port the tiny Cornish village of Mousehole (pronounced “mowsawll”) by local tradition the first place in Britain to hear the news of the great victory and soon announced publicly for the first time in Britain from the town hall balcony of nearby Penzance were the loss of Nelson and Trafalgar are still commemorated to this day. Given the slow progress in the light breeze Pickle hove to in Falmouth Bay, 10 days, 1,500 miles and an average speed of 6.5 knots from Trafalgar, having crossed the Bay of Biscay in stormy conditions. At 9.45am on November 4, the Pickle anchored in Falmouth Bay. Her commander Lapenotiere disembarked to Falmouth. Pickle was left in the charge of George Almy, his American-born second in command sailed to her home port of Plymouth. After some minor delays, we are not sure why, Lieutenant Lapenotiere took an express post chaise to London. Today it is possible to follow the route including visiting all the Ale houses were horses were changed. The route since 2005 is marked on English Ordinance Survey maps as “The Trafalgar Way”. Lapenotiere arrived at the Admiralty at 1 am on 6 November. He was promptly shown through to the First Secretary of the Admiralty, Mr William Marsden. Lord Barham, First Lord of the Admiralty who had master minded the British strategy was raised from his sleep to receive the news, with “Sir we have won a great victory but we have lost Nelson”. The Prime Minister, William Pitt received the news at 3 am and King George III and Queen Charlotte heard at 7 am. The news was being broadcast across the city with saluting guns from the Tower of London. The news was received by Emma Hamilton who became hysterical then deeply depressed. With Nelson killed the government and nation soon forgot poor Emma and her many services for her country. Emma Hamilton died at Calais in poverty, a sad end for a vivant and patriotic woman. Lapenotiere fared better, he was later given an audience with the King and Queen and was presented with a silver cruet, the first thing the King could find to hand. Two days later Lapenotiere was promoted Commander so it was good bye Pickle and eventually an appointment to the sloop Orestes. The Committee of the Patriotic Fund presented Lapenotière with a sword valued at 100 guineas. A general announcement following, bells were rung though out the land. Many people said they did not know whether to celebrate the victory or cry for the loss of their popular hero. Pickle had brought home the Lord COLLINGWOOD’s dispatches to Plymouth in fourteen days. A copy of Collingwood’s dispatch is reproduced on the web site. 1806 Lieut. Moses Cannadey took command of Pickle and she was attached to the Channel fleet. After the excitement of Nelson and Trafalgar the vessel returned to normal service. The next highlight in her career, under the command of Lt Daniel Callaway, was the capture of the French privateer cutter Favorite of 14 guns on 3 January 1807. While some 15 miles off The Lizard, Favorite was being chased by Scorpion. Pickle closed the cutter and exchanged a few broadsides before boarding her. Favorite was commanded by E.J. Boutruche and out of her crew of 70 men one was killed and two wounded. Only two months old Favorite had left Cherbourg two days before and had not affected any captures before being taken by Pickle and Scorpion. Scorpion came up and took off the prisoners to land them at Falmouth. The Master who was aboard during the battle of Trafalgar, George Almy, was severely wounded in this action. He was admitted to hospital and apparently never returned to duty. Two members of the crew, Sub Lt Charles Hawkins and Bosun’s Mate James Rowden were slightly wounded during the boarding. They survived to be awarded two clasps to the Naval General Service medal (issued in 1849), for the battle of Trafalgar and this single ship action, while Sub Lt John Kingdon and Surgeon Simon Gage Britton received the Trafalgar clasp alone. Pickle’s end was inglorious: under the command of Lt Moses Cannadey while carrying dispatches to Cadiz in bad weather, Pickle ran aground on the Chipiona Shoal 27 July 1808. She became a total loss, wrecked, but Cannadey and his crew were saved. The dispatches were eventually recovered by a Maltese diver. Collingwood ever a strict disciplinarian, still the Commander-in-Chief publicly commented on the alleged presence of a woman on board and the ‘mischief’ this must have caused. He wrote in much lighter vein to his wife on the recovery of personal letters. Cannadey was court martialled on 2 August and reprimanded. If we could locate and dive her wreck we might prove from the timbers were she was built. This was discussed by Gordon Frickers when researching in Cadiz and the San Sebastian naval base, with the University of Cadiz but the Spanish were much disorganised and no funds were available so that remains a project; perhaps for you…? Gordon Frickers has painted a second picture of HMS Pickle, “The Trafalgar Messenger”. These heritage paintings represent a unique unrepeatable moment in our lives thanks to a determined artist and the generous co operation of many people. Gordon Frickers acknowledges his appreciation and gives special thanks to all who have so willingly contributed (mostly) freely, time, expertise, experience and made available access to sources, in particular, Col Robin McNish, Peter Goodwin, Jean Paul Cans, Michel Malgorn, Joel and Marie Therese Linquette, Derek Allen, Dr. Colin White, Lt Cmdr Mike Cheshire, John Smith and the directors of Victory 2005 Ltd. Subsequently Gordon Frickers was invited to give a series of talks on Nelson as a role model at the Swarthmore centre, Plymouth. He found he had 4 Admiral’s, two captains and the rest of his audience were all company directors. Happily Gordon kept the lectures interactive so all had a great time and always a good sign, asked for more, which was not possible. 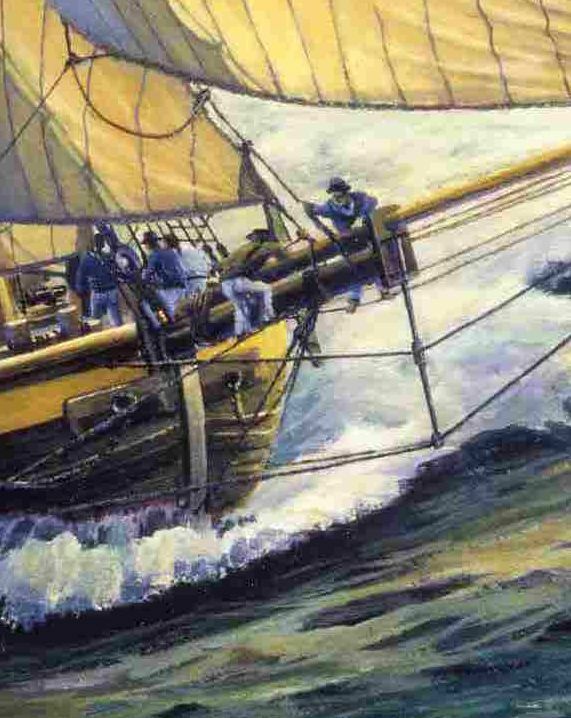 His first painting of the schooner HMS Pickle is entitled “I have urgent dispatches” is now offered for sale by the directors of Victory 2005 Ltd. The most recent picture, the remarkable “The Trafalgar Messenger” is available from the artist for £5,000. Special thanks to the Plymouth Twinning Office and to the Office des Jumalages et Relations, Brest, France. Navy Lists, Naval Chronicle and various NRS publications. The history of Bermuda’s Royal Navy base at Ireland Island. The Master’s log and muster roll. Public Records Office, Kew, London, including the Master’s Log which covers Monday 21st October 1805. Indecently it confirms the use of topsail and topgallant sail on that day. “The Ships of Trafalgar” page 154 to 159, by Peter Goodwin, Conway Maritime Press. Dodd and Pocock, but no plans seem to survive. Still in a Pickle? You are in good company, the redoubtable David Lyon wrote some years back, “Contempory Admiralty sources clearly give Bermuda as were the vessel was built. Questions remain; including which Contemporary Admiralty sources was David Lyon referring to ? © Gordon Frickers, COPYRIGHT 4 November 1997. The Trafalgar and Nelson stories are awash with myths, legends and propaganda; rather like BBC reporting on the Middle east today. Are readers given a plausible explanation? Is he really in a position to know what he claims? Has the reporter provided enough background info on the source to help us make our own judgment? Why can’t he be identified for the story? What are the source’s possible motives and those of the reporter? Could the info have been obtained on the record from somewhere else? Contact Us to purchase the original, or request information about the original . Peter Goodwin, I. Eng AMIMarE. Historical Consultant, keeper of HMS Victory, H.M. Naval Base, Portsmouth. Uniforms of Trafalgar, John Fabb & Jack Cassin-Scott, Batsford, London, 1977 (ISBN 0 7134 0218 0 (hardback), 0 7134 0219 0 (Paperback)). Sir Home Popham’s telegraphic Code, 1803 version. The Life of Nelson, The Embodiment of The Sea Power of Great Britain, second edition, Captain A T Mahan, DCL, LLD, United States Navy. See also Trafalgar Roll and sailing Navy List. Most accounts of the Battle of Trafalgar story vary and they are full of errors, the majority of plans and paintings are equally misleading, most of all though, enjoy and share your reading because we stand on the shoulders of giants. Acquire, simply, securely; to place a deposit or payment on our Payment page to make this or a similar painting, your Gordon Frickers original painting or acquire subject to availability, a beautiful Heritage quality print.